You’ll want to wear this comfy dress “day after day.” The Day After Day Tie-Back Blouson Dress is fully lined. It is made of a lightweight, gauzy cotton blend. It has thick shoulder straps, a rounded neckline, blouson fit, and an elastic waistline. The back of the dress is scooped and has cotton cords that tie. This is such a cute dress you will want to wear over and over again. 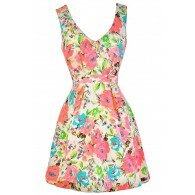 Throw this dress on and go about your day- comfortable and stylish. Pair it with sandals or wedges. Details: Fully lined. 70% cotton, 30% polyester. Lining: 100% polyester. Dry clean only. Small measurements: Length from top of shoulder to hemline: 32”. Bust: 34”. You have added Day After Day Tie-Back Blouson Dress in Navy into Wishlist. You have added Day After Day Tie-Back Blouson Dress in Navy for Stock Notification. You have set Day After Day Tie-Back Blouson Dress in Navy as a loved product. You have removed Day After Day Tie-Back Blouson Dress in Navy as a loved product.